Many political analysts have been framing tonight’s health care reform speech by President Obama in terms of his need to appeal to different audiences. Perhaps the most frequently cited audience is people who already have health insurance, to allay any fears they have that a reform bill will harm their quality of care and/or raise their costs. Another oft-cited audience is older Americans, who want to make sure their Medicare coverage is not diminished. NBC’s Chuck Todd suggests three additional audiences: ordinary Americans, progressives, and Maine’s Republican senator Olympia Snowe. I would like to suggest yet another audience, one that has proven resistant to Obama and the Democrats’ proposals for reform: men. As shown in the figure below, men have consistently shown lower levels of support for reform than have women. 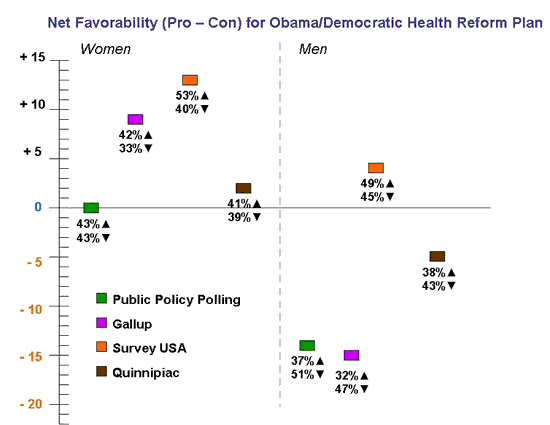 As I’ve discussed previously, relatively few polls publicly disclose demographic cross-tabulations on health care attitudes, and I applaud the pollsters who do. Where possible, I’ve plotted men’s and women’s support levels on polls’ basic favor/oppose question; however, in some cases, I’ve had to use other items (see wordings beneath the figure). Public Policy Polling (Aug. 14-17). Do you support or oppose President Obama’s health care plan, or do you not have an opinion? Gallup (Aug. 31-Sept. 2). Would you advise your member of Congress to vote for or against a healthcare reform bill when they return to Washington in September, or do you not have an opinion? Survey USA (Aug. 19). Now I am going to tell you more about the health care plan that President Obama supports and please tell me whether you would favor or oppose it. The plan requires that health insurance companies cover people with pre-existing medical conditions. It also requires all but the smallest employers to provide health coverage for their employees, or pay a percentage of their payroll to help fund coverage for the uninsured. Families and individuals with lower- and middle-incomes would receive tax credits to help them afford insurance coverage. Some of the funding for this plan would come from raising taxes on wealthier Americans. Do you favor or oppose this plan? Quinnipiac (July 27-Aug. 3). Do you think President Obama’s health care plan would improve the quality of health care in the nation, hurt the quality of health care in the nation, or not make a difference? Four in 10 (40%) adult women in the U.S. say that they are “very worried” about not being able to afford the health care services they need, compared with fewer than three in 10 (27%) men… The gender gap may be due, in part, to the facts that women are often the primary health care decision-makers in the home, that they generally have more significant health care needs than men, and that they are disproportionately lower income. Whether Obama will attempt in his speech to close this gender gap (by raising men’s support rather than lowering women’s! ), I don’t know. I suspect he’ll be focusing on the other target audiences identified by the pundits.